Apple’s distribution channels have coalesced to primarily two: their own website and their own walk-in stores. Two-thirds (67%) of the New Apple Primary PCs were bought from two sources: Apple’s website and Apple’s own retail stores. A quarter (23%) of the sales for New Vista Primary PCs came directly from the equipment manufacturer’s website. A quarter (25%) of the New XP Primary PCs sales came from the equipment manufacturer’s website. One in three (35%) New Apple Primary PCs are bought directly from the manufacturer’s website. One in three (32%) New Apple Primary PCs are bought from the vendor’s own retail store. One in three (32%) New Vista Primary PCs are bought from consumer electronic stores. One in four (23%) New Vista Primary PCs are bought directly from the manufacturer’s website. One in four (25%) New XP Primary PCs are bought directly from the manufacturer’s website. 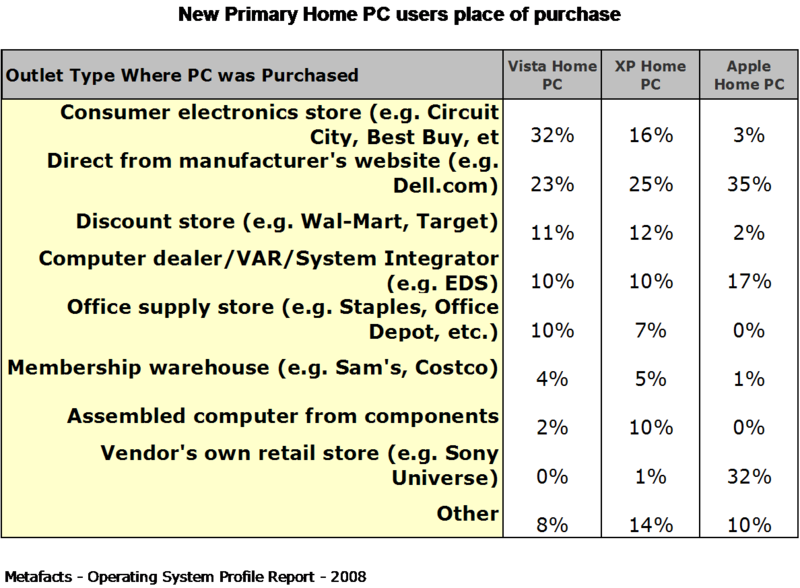 Four out of 25 (16%) New XP Primary PCs are bought from consumer electronics stores. One in ten (10%) New XP Primary PCs are bought from discount stores.o It is interesting to note that one in ten (10%) of the New XP Primary PCs were assembled from components.